If you’ve seen a blockbuster hit then you’ve probably seen a movie that includes scenes filmed at Torrance High School. It’s surely one of the most recognizable high schools in the world (okay, at least in Southern California). Dozens of movies and television series have been filmed here. Whenever a campus is needed as a backdrop in Hollywood, Torrance High School is a popular choice among directors. After 100 years, this legendary campus will be celebrating its Centennial in September to honor its rich history. The campus is pretty much iconic. In fact, it was Torrance’s first building to be listed on the National Registry of Historic Places. 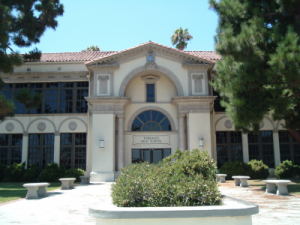 Torrance High School opened in 1917 and has more than 100 classrooms. What makes it so attractive to Hollywood producers is the beautiful and unique Renaissance architecture of the campus. It’s also close to Los Angeles studios and the beach. Plus the weather here is basically perfect. A few famous hits filmed here include Bruce Almighty, Not Another Teen Movie, and She’s All That. Popular TV shows include 90210, Buffy the Vampire Slayer and Medium. You can check out our list of movies and shows filmed in Torrance here, more than 200 have been filmed around town. Seeing your high school on the big screen would be pretty awesome. (At least we think so!) Imagine telling your teacher “Sorry I’m late, Jim Carrey needed a tour around campus.” Ah if only. Thousands of students (even some famous ones) have made their way through Torrance High School throughout the last 100 years and will reunite on September 9th, 2017 for the “Concert of the Century.” This event includes performances by alumni David Pack of Ambrosia. Get your tickets today and see for yourself why Torrance High School is so notorious. We can’t promise you Jim Carrey will be there, but at least you’ll get to see the places around campus he filmed at for Bruce Almighty. We look forward to rocking the night away with you!